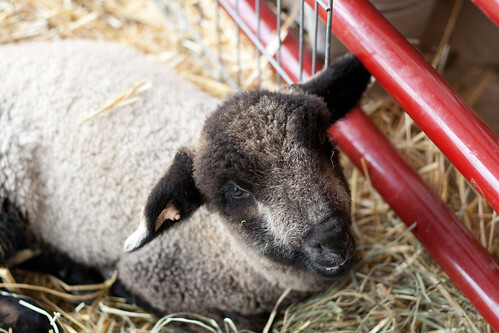 Last Sunday, Karen, Emily, and I went to the Kentucky Sheep and Fiber Festival. It was rainy and overcast, but we still had a pretty good time. There were quite a few vendors, though less then I had in my head there would be. I was amazed at how much fiber and spinners there were! There was a whole group spinning. I wish I’d taken a picture! 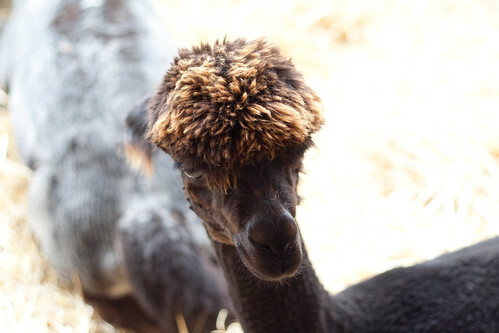 There was also a good amount of yarn, alpacas and sheep, and vendors selling non-yarn/fiber things. I didn’t get many pictures because it was icky out, but here are my favorites. Of course you know I didn’t come home empty handed! 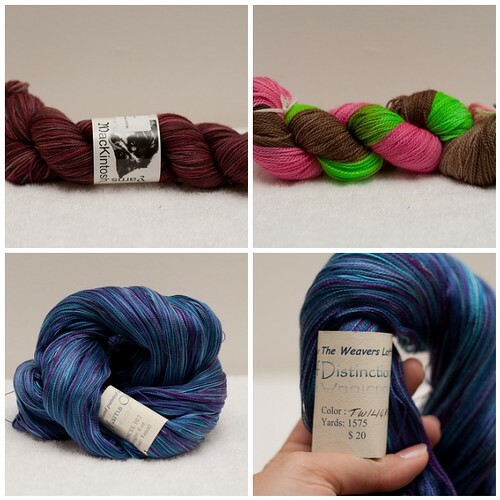 I purchased two skeins of sock yarn from MacKintosh Yarns and one skein of lace weight tencel from Weaver’s Loft. I know I just showed this WIP for the first time last week, but look what I finished! It still needs buttons (not going to keep it closed with DPNs forever! ), but I have some picked out and I’ll be washing and blocking this tonight. I absolutely LOVE how this turned out. 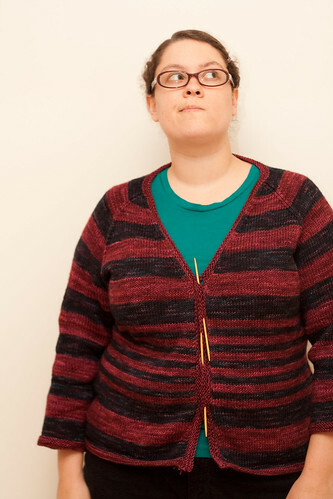 This is the best fitting sweater I’ve knit so far. I love everything about it. I can’t wait to get it washed so I can start wearing it! Even though it’s getting warmer, there are still some cool nights and it stays cool in my office, so I’m sure it will get some use before it gets really hot here. Since I finished the sweater and was in the process of deciding what to knit next, I’ve started working on the Labyrinth sock again. 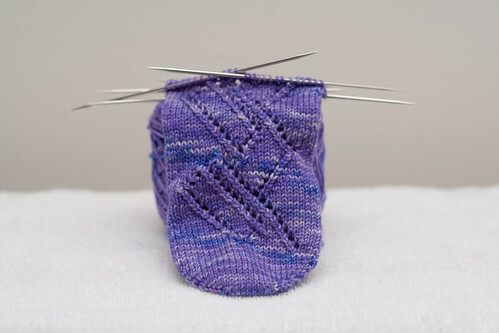 Yesterday I turned the heel and I’m about halfway done with the leg. Here it is two repeats into the chart (I’m on the 5th repeat now). I have to admit… I’m feeling project withdrawal from Tempest pretty badly. I put all my other projects aside to work on this one. I was enjoying the designing of the modifications, the yarn, the colors… everything! 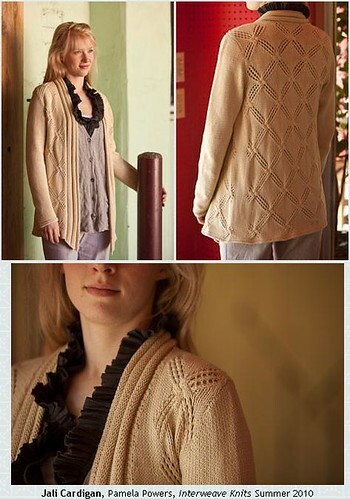 For about a week I’d been considering what I want to knit next when I got an email from Interweave Knits about the Jail Cardigan. I knew I wanted this to be my next sweater with a few modifications. I’d like to make it shorter in length (take off 2-3″ from the bottom) and possibly do 3/4 length sleeves instead. Once I finished knitting Tempest, I started considering my yarn options. 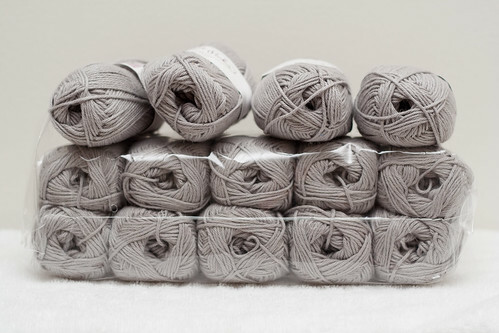 I ended up deciding to get Knit Picks CotLin after reading up on it and getting some opinions from other knitters on how it holds up as a garment. 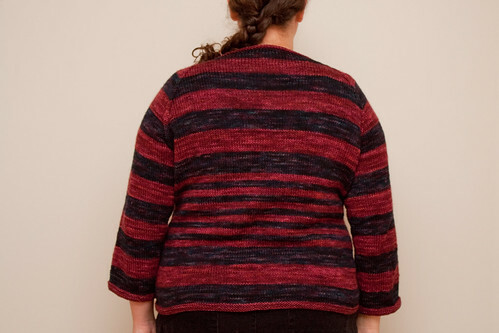 My major concern was that the yarn is a cotton and linen blend and that it would be too heavy as a finished sweater. I love Ravelry for this! 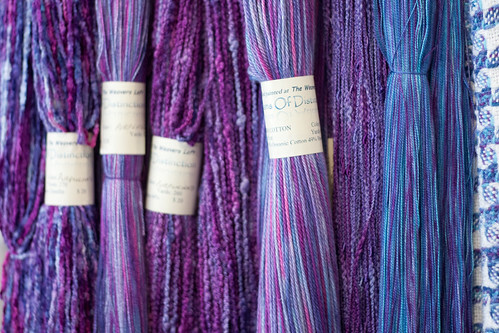 It’s a great way to find out about a yarn before committing. I ordered the yarn Wednesday morning, it was shipped a few hours later and on my doorstep when I got home from work today! That’s amazingly fast for Knit Picks, especially when there’s free shipping. I’m sure it doesn’t hurt that I live in the same state it gets shipped from. I decided on a light grey for this sweater. I figured that way it would go with all of my wardrobe and I don’t have any sweaters like that yet (though Tempest does go with most of it). I’ve already done one swatch and it looks like I’ll need to go down a needle size, so I’ll knit another swatch tomorrow. I do like how it knit up and washed. I’ve not experienced any of the fuzzing that some people mentioned and it’s really quite soft – softer then I expected. Can’t wait to get this started! Can’t wait to see your Jail cardigan finished and in progress. I think it will look wonderful on you with your mods.